The power of Christian Book Marketing can help you market your Christian book, drive traffic to your author’s website, author’s blog, Amazon book page, Kindle book page and more, all while increasing your online presence, page positioning, page ranking and overall image on the Internet. 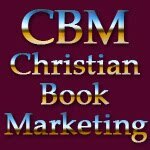 CBM Christian Book Marketing offers a variety of services. Includes Your Book Cover Image, About The Author, Book Description And A Link Back To Your Authors Website, Blog or Authors Page On 100 Separate Christian Sites. Book reviews are a part of every authors promotional picture. We see them on author sites, author blogs, in social communities and on other author and book related sites all over the Internet. They are essential and simply a part of the promotional book marketing arena and are a very powerful marketing tool. We not only have the ability to professionally review your book. We can also use the book review as a powerful book marketing tool and place the book review on 100 separate Christian sites that all share the love and redeeming passion of Christ with the nation of the world. A professionally written press release can make a huge difference for a new author or book release. With a professionally written and submitted press release written by CBM’s Christian Book Marketing’s Press Release department, both you as author and your new book release will receive expanded exposure. We can also use your book review as a press release provided that it was written by our staff. Contact us regarding your Christian Book Marketing Press Release needs. CBM Christian Book Marketing can not only write and professionally submit your press release where all the right people can see it, we also can post your press release on 100 separate Christian sites. Check out our Christian Book Marketing Press Release page for further information. Book trailers are a great way to promote and market your book. They can be displayed on author web sites, on blogs, in networks, communities, social communities and wherever video’s can be hosted at. You Tube is a perfect example of the video craze with millions of videos and daily viewers. Let our staff create a book trailer that promotes your book and fits into your budget. Don’t have time for a book review. Use our Christian Author Article Blast which includes the following posted on 100 separate Christian sites. A professionally written article, very much like a book review or press release. We incorporate an image of your book cover. We add a link back to your author’s web site, author's blog and/or book page. We post the article on 100 great Christian sites that all share the love and redeeming passion of Christ, God’s Word, Kingdom Principles, Encouragement and Hope. The Article Blast remains on the sites for one full year. What are the benefits? You get the same benefits that you would get using our book review marketing or press release submissions and marketing. Increases page positioning on the major search engine. Helps to increase page rank. Looking to expand your reach and create a online presence. We can help. We design, create and launch author web sites, author blogs and author pages. Visit our Christian Web Design page for more information. Unlike other marketing programs that offer author promotions and book marketing on one site with monthly renewal fees, we offer author promotions and book marketing programs on 25 sites, 50 sites, 75 sites and up to 100 sites with no monthly renewal fees. You get one full year of online author promotions and book marketing and at affordable prices. Now that’s good news!